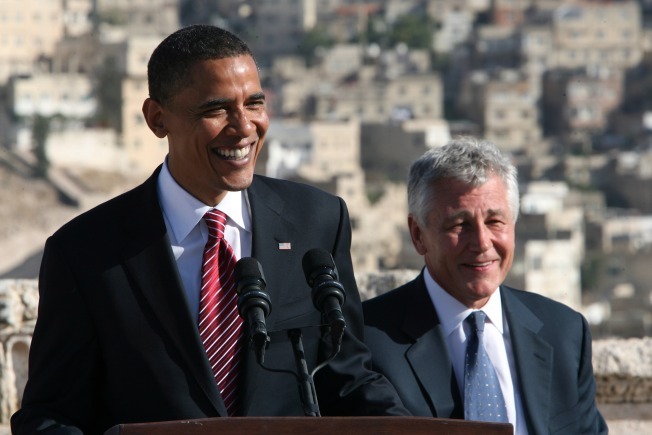 Then-candidate Barack Obama with Sen. Chuck Hagel (R-NE) during a news conference at the citadel July 22, 2008 in Amman, Jordan. Sen. Hagel could be one of the few Republicans to get a spot in the Obama cabinet. Appearing on CBS’s “60 Minutes” last Sunday, Barack Obama reiterated a campaign trail promise. “Yes,” the president-elect told Steve Kroft, he would include Republicans in his cabinet. Pressed if there would be more than one, Obama declined to elaborate. As the top tier of his cabinet begins to come into focus, however, it looks increasingly unlikely that Obama will break new ground when it comes to fashioning a bipartisan government. Instead, he appears to be taking a check-the-box approach that would differ little from the pattern set by predecessors Bill Clinton and George W. Bush. They both made a nod to the opposition party in their cabinet selections, but in the main did not depart from Washington’s to-the-victor-goes-the-spoils tradition in their personnel choices or the policies that flowed from them. The most likely Republican for a top Obama post, based on published speculation and reporting within his transition team this weekend, is Defense Secretary Robert Gates, who might keep his job in at least the opening phase of the new administration. Obama has said foreign policy is the area most in need of more bipartisanship, and the likely appointment of Sen. Hillary Rodham Clinton (D-NY) leaves few other openings. A Gates re-appointment would send a message of caution and continuity within national security circles—not exactly the message that Obama’s most ardent anti-Iraq War supporters are yearning for. But it would hardly signal a dramatically new style of partisan bridge-building. For one, Gates is not a sharply partisan figure. Before becoming president of Texas A & M, he was a lifelong national security official, spending most of his career in the CIA and heading the spy agency under the first President Bush. For another, he almost certainly would be a transition figure, rather than one expected by the public or colleagues to stay put or be a decisive policymaking voice for a full term. Nor would there be novelty in Obama reaching to a moderate figure from the opposition party to lead the Pentagon. That was exactly what Clinton did in 1997 when he tapped then-Sen. William Cohen (R-Maine) to be his second-term defense secretary. In addition to Gates, a senior Obama advisor pointed to two other names previously in circulation as possibilities for top foreign policy jobs: former NATO commander Jim Jones, a prospect to be White House National Security Advisor, and Sen. Chuck Hagel (R-Neb.). Jones also devoted his professional life to national security, rising to become a four-star general and the Commandant of the Marine Corps. Even after retiring from active-duty two years ago, he was tight-lipped about his partisan leanings, declining to tell a Wall Street Journal interviewer which party he belonged to. Jones advised both Obama and John McCain, an old friend, in the presidential campaign. Hagel is the only politician among the GOP names most commonly mentioned for top jobs, but he fell out of favor with his own party over foreign affairs, and especially the Iraq war. Despite being one of only a handful of senators to support McCain in 2000, Hagel endorsed neither candidate this year. He did, however, take a high-profile trip to the Middle East with Obama and Sen. Jack Reed (D-RI) this summer. Republicans are keeping a close eye on who Obama picks – and doesn’t pick. "Leader Boehner obviously hopes and expects that the President-elect will keep his promise to include Republicans in his cabinet,” said Michael Steel, a spokesman for House Minority Leader John Boehner. “Obama has pledged to govern in a bipartisan way, and we have pledged to work with him when he does." Michael Beschloss, the presidential historian, agreed the move would be significant, considering the context in which Obama is taking over from an unpopular and beleaguered president. “For Barack Obama to appoint somebody tied to George W. Bush’s administration, and especially his foreign policy, would be a significant gesture across the aisle,” he said. And while the move would not represent anything like a coalition government of the sort common in parliamentary systems, this should hardly come as a surprise. “It’s very rare that we’ve really had a bipartisan cabinet,” noted Beschloss. Indeed, a look back at the modern American presidency reflects a pattern of tokenism when it comes to appointing members of the opposite party. The current President Bush, for example, had a longtime Democratic member of Congress, Norman Mineta, serve in his cabinet – but as a rarely-seen transportation secretary. Jimmy Carter invited James R. Schlesinger, a former cabinet secretary in the Nixon and Ford administrations, to serve as his secretary of energy. But Schlesinger’s departure from the Ford White House was so acrimonious that his walk across the aisle was a pretty short one. The same was true of Democratic Texas Gov. John Connally, who became Nixon’s Treasury secretary as he grew increasingly estranged from an increasingly liberal party that he would abandon two years after entering a GOP administration. Beschloss noted that Kennedy also considered holding over a Republican named Gates at Defense. Thomas S. Gates Jr served as President Eisenhower’s last Defense Secretary and the young president-elect from Massachusetts thought that at a time of security tensions it may be reassuring to keep a familiar figure at the Pentagon – and perhaps take less political heat off him from congressional Republicans in the process. The idea was to install Robert F. Kennedy as Gates’ deputy, and train him to take the top slot after a year. But Joseph P. Kennedy, the president’s father, wanted RFK as Attorney General and some Pennsylvania Democrats thought Gates was eying a statewide run as a Republican in his native state. If Obama comes to regret his loud promises of bipartisan cabinet appointees, this too would be following a familiar path.